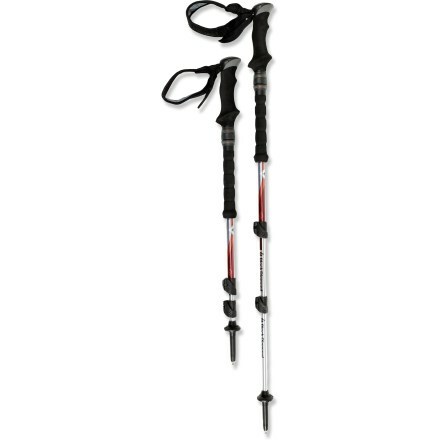 Black Diamond trekking poles are the most common hiking poles used. 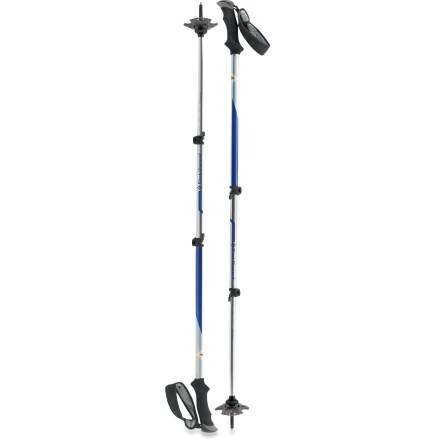 Adjusting the length is easy on these compact trekking poles, and antishock saves your knees from harm. 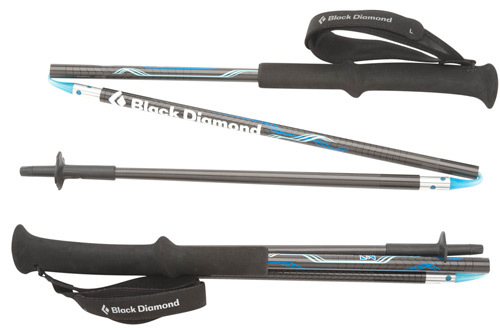 Learn more about the best Black Diamond walking poles below. The below Black Diamond trekking pole comparisons take the three best trekking poles by Black Diamond and reviews them side-by-side. What locking mechanism is best? Since all Black Diamond hiking poles use a FlipLock locking mechanism (by far the easiest method of adjusting the length on trekking poles), all you need to decide on is if you prefer anti-shock and extra weight, or no anti-shock and lighter weight. 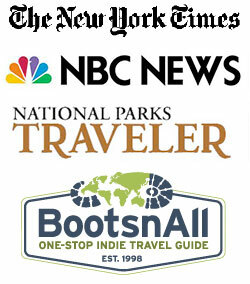 Bottom line is that it’s easy to decide on the best Black Diamond trekking pole to meet your hiking needs. Black Diamond walking pole reviews can be tricky: 3 models exist and each model has sub-categories within the model. For most, there is the basic model, an antishock version, and a collapsible or compact version. When reading Black Diamond trekking pole comparisons, first decide on an overall model based on your hiking needs and economic restraints. After, determine if you’d like the ultralight/standard version, compact version, or antishock version. Without question, Black Diamond Trail Trekking Poles are the best hiking poles made by Black Diamond. Need to know why? There’s not much more to say about the Black Diamond Trail Trekking Pole. If you want quality, reliability, and antishock for a reasonable price, purchase Black Diamond Trail Shock Trekking Poles . If you don’t need antishock and want the best hiking pole for the cheapest price, go for the regular Black Diamond Trail Trekking Pole. If you are young with healthy knees and hips, the Black Diamond Ultra Distance might be for you–hikers reading these reviews in order to prevent knee damage should skip this section entirely as the Black Diamond Ultra Distance does not have antishock. These hiking poles are made for ultralight backpackers that want to cover massive distances each day. Since the Black Diamond Ultra Distance has two hand grips (standard and one below), you rarely need to adjust the length. And that’s a good thing since you CAN’T. Yes, that’s right. You can’t adjust the height on these poles. Instead, they collapse in a cool way, that allows you to easily stash the poles in any corner of your backpack. While these are expensive poles (around $150), if you’re looking for an ultralight hiking pole, it doesn’t get any better than the Black Diamond Ultra Distance. They weigh a total of 9.2 ounces for the 100cm pair… yes, you read that correctly. 9.2 ounces. The Black Diamond Contour Trekking Pole is secure, versatile, lightweight, and models can come anti-shock, non-antishock, compact, or regular. Contour Elliptic Compact – Collapsible hiking pole version of Contour Elliptic. Again, the disadvantages of this hiking pole are the same as the Contour Elliptic. Don’t purchase it. Contour Elliptic Carbon – The most expensive hiking pole in the Contour family. Lightweight (1 lb 3 ounces), single grip, collapsible, with carbon-fiber construction in the upper shaft. Features galore, but is it worth the price tag? No. After all these Black Diamond trekking pole comparisons, what is the bottom line? The Black Diamond Trail model is the best Black Diamond hiking pole. You get dual-grip, equal weight as other models, and antishock all for a lower price tag. While I personally opted for a Komperdell Hiking Pole, which is even lighter, cheaper, but without anitshock, if you are looking to minimize damage to your knees and hips, purchase the Black Diamond Trail Trekking Pole. Learn more about the Black Diamond Trail here.